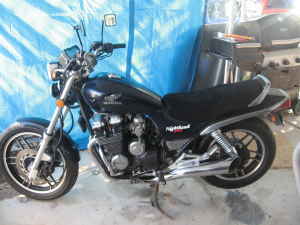 On October 21, 2007 I purchased an ’83 Honda Nighthawk 650. This blog is just so I can chronicle the rebuild. Mostly for my own memory, but if you want to read it too that’s fine. The best place to begin is ofcourse the first post. On March 28, 2009 I purchased another Nighthawk, this one is an ’84 700S blue on black. I look forward to seeing things progress!! i have an 86 nighthawk 650 & i just wanted you to know your blog helped me tremendously.in oct. my bike fell over& the kill switch broke in you cant believe how many pieces. it needless to say would not start & i tried to find out at many different websites how to bypass the killswitch to no avail. i did find your blog a couple of weeks ago that said your right hand control had the wires cut off so short & what ever & it said the killswitch wires were wired permantely together so….b4 i only had a pitiful little piese of black plastic with 2 wires dangling there but i wired them together & it starts perfectly! !thank you so much..
Dass my boy!! De froot of my loins!! Hey, good to see this, nice to know I’m not the only one messing around with one of these. Mine is an 83 I bought a few years back, which Ive wrestled with the charging system for most of that time. Fianlly broke down and bought a stator and replaced it, fixed that problem. Fabulous job on the website! And thanks again for all the useful information. Hmmmm…. Now I wonder where you learned the trick of blowing up the wiring diagram? Great Blog! I live in Canada and I bought a 1985 Blue/Black Nighthawk S last year. Up here it’s a 750cc version of the 700S (same bike except for the displacement) I’m having it repainted and had the cam chain tensioner replaced. Great bike! I always wanted one and now I have it! I love your blog and your zeal for restoring the older bikes. I’m in Pearland, I have a couple 70′s and 80′s bikes I am restoring. Give me a shout sometime, would love to ride over and get a burger.